Robert Beltran is an American actor best known for his role as Commander Chakotay, in the science fiction television series Star Trek: Voyager. The plot is about the starship Voyager which was dramatically propelled into the distant Delta quadrant by powerful alien technology. Chakotay is the commander of a renegade Maquis vessel that Voyager was trying to capture and was dragged along with them. Unfortunately, there would be no similar “express” route to take them home again but Chakotay and his crew are persuaded to join forces with Voyager. Stranded 70,000 light-years from Earth, the series documents the long voyage back home. Its often the case that an actor who is strongly associated with a particular part will have elements of the role described in his chart. Beltran has the Sun in Scorpio and the Moon in Taurus. Beltran’s Scorpio Sun neatly describes the rebel Maquis commander that he plays. Its interesting to note that the Captain of Voyager is played by a female ( Moon ), actress Kate Mulgrew who has the Sun in Taurus which accurately describes her role as the steady and conventional Kathryn Janeway. Beltran’s Scorpio Sun ( Chakotay ) is opposite the Moon ( Janeway ) and initially they are enemies. The opposition focuses by T Square onto Pluto conjunct the Ascendant. An apex Pluto will always signify a sudden atomic event that transforms the landscape beyond recognition. What could be more Plutonic than suddenly being projected by alien technology to another dimension light years from home ? The Sun is at the very base of the chart which signifies home and the Moon is in the 9th house symbolising long journeys. So the central focus of Beltran’s chart aptly describes the predicament that Voyager finds itself in. Janeway and Chakotay put aside their Taurus / Scorpio oppositional issues for a joint effort to get back home which is the most positive response to a T Square imaginable. 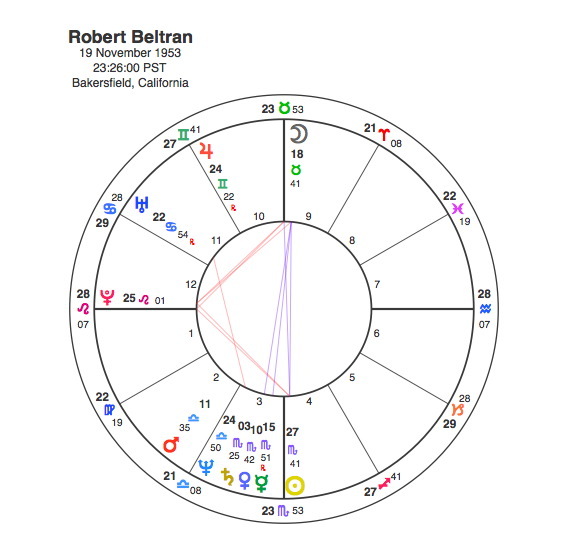 Robert Beltran is in the unusual position of having a chart that contains a T Square with the 3 main personality indicators, Sun, Moon and Ascendant all involved. Consequently Pluto would only make one transit to these points in a lifetime. If the reader is not convinced about this manipulation of the symbols of a chart to form the plot of a TV series it might be interesting to note that Pluto, the apex of the T Square and the cause of Voyager’s sudden emergence in the Delta Quadrant was exactly conjunct Beltran’s Sun and square his Ascendant in January 1995 when the series began. Pluto ensured that Robert Beltran in the guise of Commander Chakotay would have to boldly come back from a place where no man had been before.